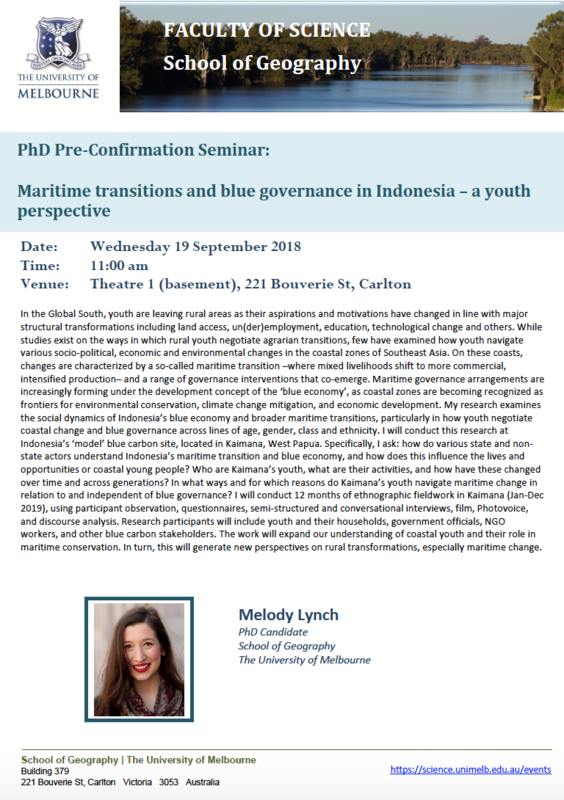 On Wednesday, September 19th, I will be presenting my proposed PhD research on maritime transitions and blue governance in Indonesia – a youth perspective. The seminar will take place at 11am at the School of Geography, University of Melbourne, 221 Bouverie Street, Carlton (Theatre 1). Abstract: In the Global South, youth are leaving rural areas as their aspirations and motivations have changed in line with major structural transformations including land access, un(der)employment, education, technological change and others. While studies exist on the ways in which rural youth negotiate agrarian transitions, few have examined how youth navigate various socio-political, economic and environmental changes in the coastal zones of Southeast Asia. On these coasts, changes are characterized by a so-called maritime transition –where mixed livelihoods shift to more commercial, intensified production– and a range of governance interventions that co-emerge. 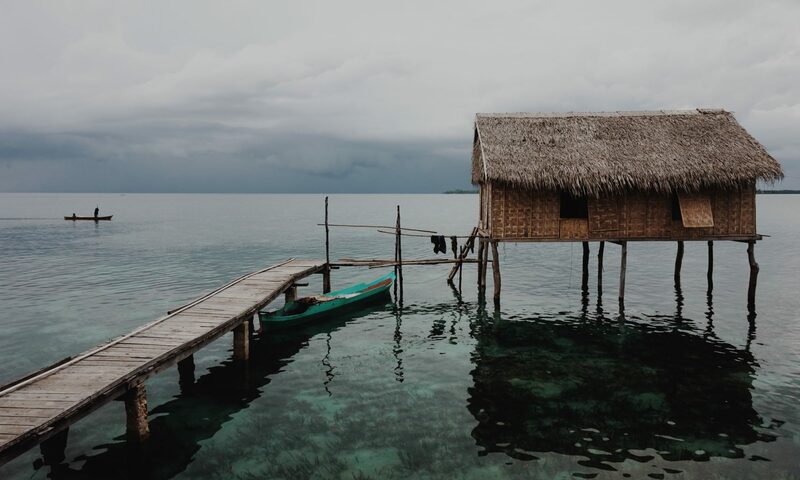 Maritime governance arrangements are increasingly forming under the development concept of the ‘blue economy’, as coastal zones are becoming recognized as frontiers for environmental conservation, climate change mitigation, and economic development. My research examines the social dynamics of Indonesia’s blue economy and broader maritime transitions, particularly in how youth negotiate coastal change and blue governance across lines of age, gender, class and ethnicity. I will conduct this research at Indonesia’s ‘model’ blue carbon site, located in Kaimana, West Papua. Specifically, I ask: how do various state and non-state actors understand Indonesia’s maritime transition and blue economy, and how does this influence the lives and opportunities of coastal young people? Who are Kaimana’s youth, what are their activities, and how have these changed over time and across generations? In what ways and for which reasons do Kaimana’s youth navigate maritime change in relation to and independent of blue governance? I will conduct 12 months of ethnographic fieldwork in Kaimana (Jan-Dec 2019), using participant observation, questionnaires, semi-structured and conversational interviews, film, Photovoice, and discourse analysis. Research participants will include youth and their households, government officials, NGO workers, and other blue carbon stakeholders. The work will expand our understanding of coastal youth and their role in maritime conservation. In turn, this will generate new perspectives on rural transformations, especially maritime change.